This is a composite image of the northern part of the galaxy cluster Abell 1758, located about 3.2 billion light years from Earth, showing the effects of a collision between two smaller galaxy clusters. Chandra X-ray data (blue) reveals hot gas in the cluster and data from the Giant Metrewave Radio Telescope (GMRT) in India (pink) shows huge "halos" generated by ultra-relativistic particles and magnetic fields over vast scales. Optical data from the Digitized Sky Survey are colored gold. Galaxy clusters are the largest structures in the Universe that are bound together by gravity. They form when smaller clusters or groups of galaxies collide and merge. Collisions between galaxy clusters, such as this one in Abell 1758 and its more famous cousin the Bullet Cluster, are the most energetic events in the Universe since the Big Bang. Their growth rate over the last 7 billion years has been slowed by the effects of dark energy, as shown by previous studies with Chandra. Scale Image is about 13 arcmin across (about 12 million light years). 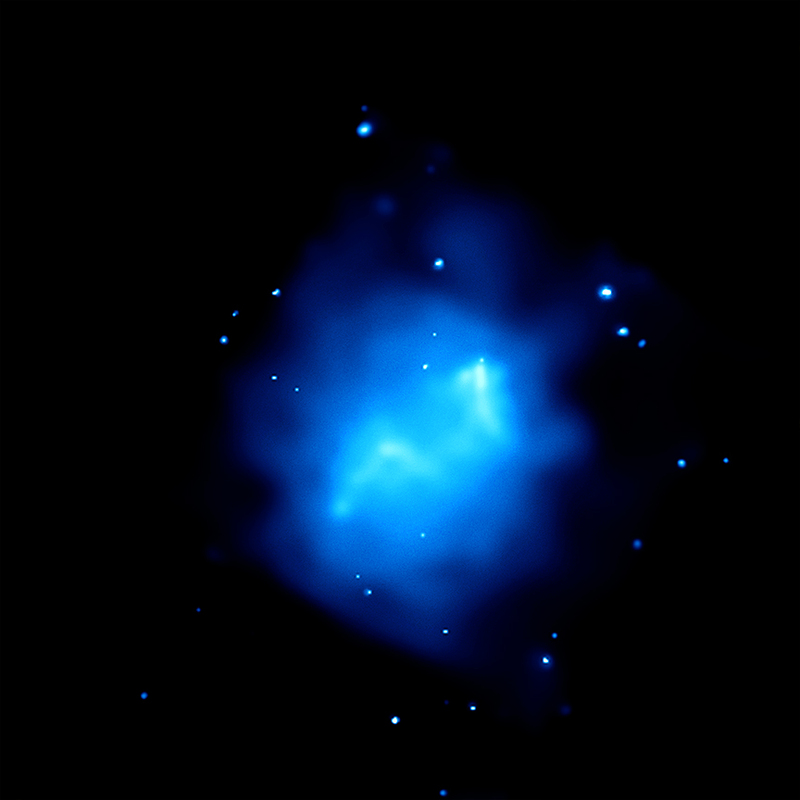 Coordinates (J2000) RA 13h 32m 43.20s | Dec +50° 32´ 25.70"
In the x-ray image, what are the points surrounding the emissions from the cluster itself? I think this is the only site I've visited that shows images from radio, visible, and x-ray wavelengths superimposed. This really has a big impact, and makes it possible to imagine the processes going on better. Thanks for this! Thanks for your interesting question. It is possible that a few of the galaxies within the clusters will merge, but nearly all of them should remain relatively unaffected, as is being seen in the galaxy cluster collision that is occurring in the Bullet Cluster. There is a lot of empty space between galaxies in a cluster. When these galaxy cluster are in the process of merging maybe some of the galaxies in them possibly merge also. Sir, The existence of and the collision after effects of galaxy clusters is well explained. I wonder how many other civilizations in the universe would have seen this? Thank you all for your dedication in helping us laymen understand this complex phenomenon. Wish I could live another 60 years, simply to witness, as time advances, the fantastic discoveries waiting to be made. This is very nice image. The explanation and details provided in this page is so nicely arranged. The picture is very beautiful. A galaxy cluster located about 3.2 billion light years from Earth. About 3.2 Billion light years from Earth. 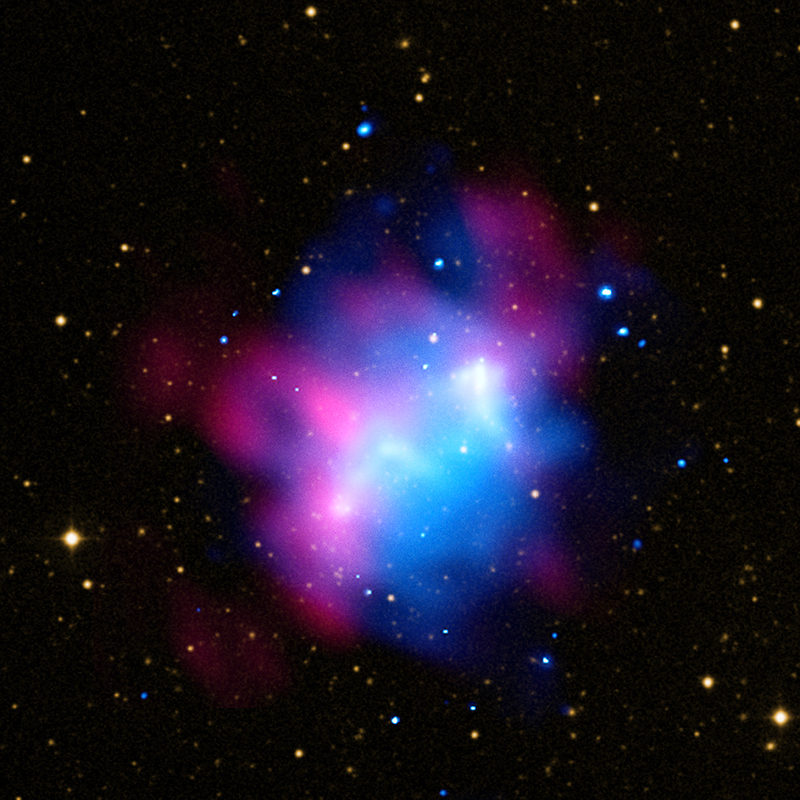 X-rays from Chandra, data from the Giant Metrewave Radio Telescope and Optical data from the Digitized Sky Survey. About 12 million light years across. X-rays are blue, the radio data are pink, and the optical data are gold. In the constellation Canes Venatici visible in the Northern Hemisphere.